Home / International / News / Sackur to Tagle on billons of church wealth: Why on earth do you need this vast resource? 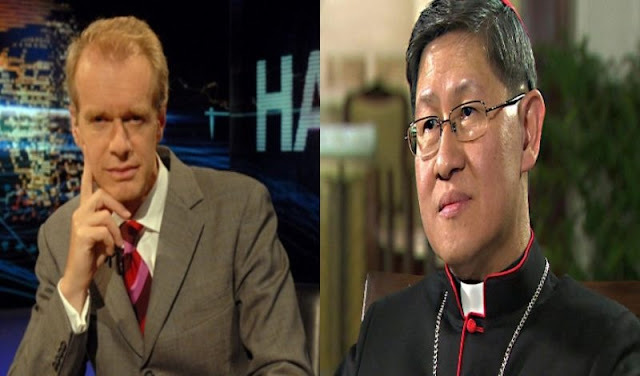 Sackur to Tagle on billons of church wealth: Why on earth do you need this vast resource? The Facebook blog Admin Fire Volume 5 shared a portion of Luis Antonio Cardinal Tagle's interview in BBC Hardtalk with Stephen Sackur, and rebutted his claim that the massive funds of the church goes to charity in times of necessity, saying that if so, why does the institution still ask for money from its constituents. Last 11 March 2015, Tagle was interviewed by Sackur and he said that the biggest charitable institution, when asked where the massive church fund is being spent on. Sackur asked the church leader how much the institution is worth, and Tagle denied knowing and said that the Securities and Exchange Commission have a record. "This diocese owns ten percent of one of the country's biggest banks, is worth hundreds of millions of dollars, it has seat in the board of the bank, It owns other vast stock investments in mining companies in other things. It has foreign currency holdings. It has bonds. Why on earth do you need this vast resource?" Sackur said. Tagle replied that the funds were accumulated after 400 years of the church's existence in the country. "For Church which is supposed to be committed to humility and to be reaching out to the very poorest in this country, do you think it is a little bit of problem that the church is actually one of the wealthiest institutions in the land?" Sackur said. Tagle replied: "The biggest charitable institution in the Philippines is still the church. When you look at response to disasters, it is still the church that still remains to be the single institution of charity. And if ever dioceses and religious orders have property and investment, we also have to look at how that is spent, and the number of employees, the number of needs, the orphanages, the hospitals--all of those are sustained also by Church funds. " The blog then reacted to the three year old video, and said that it depicts how Cardinals get away with difficult questions about the church. "Sang-ayon ba kayo na pinakamalaking Charitable institution daw sa bansa? Samantalang kung meron mga sakuna, di po ba nanghihingi ang simbahan ng tulong mula sa mga member nito para maitulong sa naging biktima ng sakuna? At hindi natin alam kung umabot ba yong tulong na binigay natin?! Yong mga paaralan na pagmamay-ari o inooperate ng simbahan, di po ba mahal na ang bayad may government subsidy pa dito na kasama. Pano naging charitable yon?," it said. "Yong mga bahay ampunan na sila ang nag-ooperate di po ba merong mga sponsors at donors na mula sa mga pribadong individuals yon? Sige nga magbigay kayo ng hospitals na operated by Catholic groups of Nun and priest na mura lang ang bayaran, at affordable para sa mga mahihirap," it added. The blog emphasized that church funds come from citizens who give. "MY POINT IS, HINDI NAMAN MULA SA SIMBAHAN ANG PERA NA GINAGAMIT SA MGA ITINUTURING NILANG CHARITABLE INSTITUTION. THE FACT, LAHAT NG INOOPERATE NILA AY TAX EXEMPTED!"